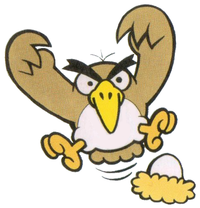 The Bird is the first boss found in Super Mario Land 2: 6 Golden Coins. It lives in its giant nest at the top of of the Tree Zone and guards one of the six Golden Coins, which is hidden in a huge egg. The bird attacks Mario by swooping at him. In order to defeat it, Mario has to jump on its head three times or hit it with six fireballs. After the bird is defeated, the Golden Coin of the Tree Zone is revealed from the egg. His swooping behavior is somewhat similar to Hoo from Super Princess Peach. The bird reappears in the comic Mario vs. Wario, where he gets hit by the witch after she launches her fire and gets burnt. Kurosu Portmanteau of 「黒」 kuro meaning "black" and 「カラス」 karasu meaning crow. Also translates as "cross". French Cross Transliteration of the Japanese name. This page was last edited on February 11, 2019, at 03:32.